Gone are the “Mom, get off the phone!” days when parents could try to surreptitiously listen in on their teenagers’ calls. Back in 2006, four-in-ten teens (39%) said they talked daily with their friends on a landline phone; by 2011, just 14% did. But that doesn’t mean parents aren’t monitoring their teenagers’ behaviors in other ways. With so much of a teenager’s social activities now happening online, parents have had to adapt. Today, 60% of parents say they’ve checked their teenagers’ profile on a social networking site, including roughly similar shares of moms (62%) and dads (58%), according to new Pew Research Center data. 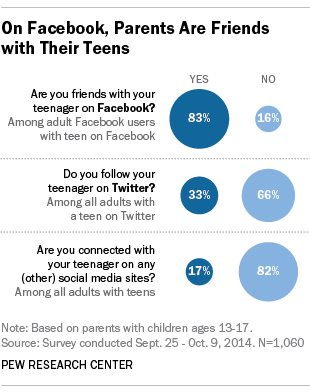 Additionally, a third of all parents whose teen uses Twitter say they “follow” their teenager on that platform, and 17% of parents are connected with their kids on at least one other social media site, such as Instagram or Pinterest. Teens are well aware of their online reputations, and they actively curate their content and appearance on social media, according to our 2013 report. For example, 59% of teenage social media users have deleted or edited something that they posted; 53% have deleted comments from others; and 45% have removed their name from photos. While most teen Facebook users (85%) say their parents see the same content as everyone else, 5% say they’ve adjusted privacy settings to limit what their parents can see. Even though many teens haven’t used technological tools to shield their posting activity from their parents, teens have other ways to hide information from their parents’ gaze. A majority of teens (58%) also have obscured the content they share on social media in general, using inside jokes or other coded messages that only certain friends can understand.